Dangerous journeys, pushed around all over Europe, housed in collective homes which are of­ten far away from any infrastructure, vouchers, work ban, a daily fight for adequate med­ical care, permanent fear of being deported … and in addition sexism, as each woman exper­iences on top of that … we refugee women have every reason to get loud and to demand a life in human dignity. In summer 2014, we want to participate, along with other refugee women, in a project of the musician Heinz Ratz and his band Strom & Wasser: On rafts we will travel on rivers and canals, from July 14^th to August 27th, from Nuremberg to Berlin. This will be a floating demonstra­tion to draw attention to the situation of refugee women and children, and to loudly voice our demands in public. 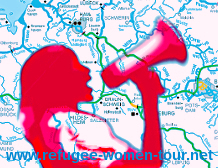 We want to use this tour together with you to network with refugee women, other refugee organisations and to talk with refugee women all over Germany. We will report on our experiences during the trip on a web blog. That way we will docu­ment the situation of refugee women in Germany and make public our and your demands and your and our resistance. Refugee women, sisters, friends, supporters, activists: Join us! Support us as a reporter, driver, translator, with child care …!